Amie was different and how well she was to be accepted by those around her had to be set up by how well she accepted herself. Amie knew she was different, after all her name was spelled "AMIE" not Amy. It became apparent very early on that when people met Amie that she would make a significant impact on their lives. They never forgot her, not so much because she looked different but because of who she was. Amie always had the ability to put people at ease with her easygoing demeanor and sweet personality. Don and I raised Amie as we would have raised any "normal" child. We gave her love and respect, and expected the same in return. Amie was not given special treatment just because she was different. Amie was told "No", got her share of spankings, and was expected to behave just as any normal child would have been expected for their age. We encouraged the Grandparents, Great-Grandparents, Aunts and Uncles, and Teachers all to do the same. For to allow any child to run the family, usually means grief for all concerned. We were not about to have a spoiled brat on our hands; we already had enough to deal with as it was. spoke earlier of our support team; well, initially it meant our medical back up which consisted of my Dad and my sister Dorene. After all, if Don or I were suddenly unable or unavailable to take care of Amie, we would have needed help; with special need children you don’t just call the neighborhood teenager to come and baby-sit. There also needed to be backup so Don and I could have a night out with each other without responsibilities. As Amie grew and needed less medical attention, our circle of support was able to grow also. Our families, Don’s and mine, as a whole were always behind us. One small example was Amie’s Great-Grand Parents. They were both in their seventies when Amie was born and very much wanted to help. We had started out using cloth diapers, but doing the normal laundry and trying to keep up with the daily mountains of diapers was a chore my Grand Parents thought we didn’t need to hassle with along with everything else. 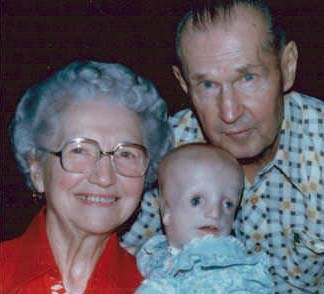 They could not physically take care of Amie but they diapered her little behind; Grampy and Granny kept Amie in disposable diapers until she no longer used them. Everyone did what he or she each could and we appreciated all of it very much. Amie’s Gramma, being an antique dealer, was an avid garage sale and flea market shopper, so Amie had a wide variety of toys as she grew up. It became hard to tell where the family room was after awhile because it was looking more and more like a toy store. There was hardly a day that went by that Gramma didn’t stop by with some new interesting stimulating noisemaker of some sort. Gramma insisted that variety was the spice of life, and one could not have too many toys. You know Grandparents - they love to spoil their Grandbabies. Amie was the only one they had to spoil at this point in our family…and spoil her they did. I’ve said before that we didn’t shelter Amie. She had to learn how to live in this world. We made the best effort possible to expose her to life and expose life to her. Yes, sometimes people were taken back by her appearance. First, we would help Amie deal with it, and then we would hopefully make the others more comfortable. Did we mind when people asked questions? Not at all. It takes a lot of guts to approach a stranger and ask about why a person looks the way they do. We tried to not put people in the position where they felt uncomfortable, but sometimes it was just unavoidable. Children are the easiest to deal with because they’re usually not afraid to ask questions. If one approached them with sensitivity and kindness, they usually warmed right up to Amie and accepted her as just another kid (which in reality is what she was). When Amie was about six months old, she was started in the Infant Development Program two days a week. This is a program set up for all handicapped children whatever their disabilities might be. The idea of this program was to give special needs children a little bit of edge to social life before they start in a pre school. Most handicapped children have very little interaction with other children just because of their limited exposure; most do not get exposure through daycare centers as so few day care centers accept children with disabilities. The Infant Development Program creates a program designed specifically for each child’s needs. It also helps the parents to learn how to better help or cope with their child and his needs. In California, this program was set up for children from infant to three years of age; a separate program was also available for children ages 3 to 5. Amie didn’t participate in the older program as we felt she was ready to be mainstreamed into a regular pre-school setting. This is a very under utilized program and is available to all disabled children regardless of what their handicap is. It is something that I would strongly recommend that every parent with a special needs child should look into for themselves and their child. If your pediatrician or social worker hasn’t already informed you of this program, call your local school district; the program is free, (its part of what you pay taxes for). When it came time for pre-school and elementary school, I did what most parents did. I looked around for the best situation for my child. We talked to other parents and professionals and worked with their recommendations. We went to different facilities, interviewed the staff, and checked out what they had to offer. Sounds pretty normal up to this point. Then you bring up special needs that your child has and find out if they’re able to work with them. It all boils down to which you feel you’re most comfortable with. As Amie neared kindergarten age, it was suggested that we have her I.Q. tested. Amie would be only four years old when she started school, so she was on the young side for starting kindergarten. There was concern that maybe we should possibly hold her out another year before starting kindergarten. We did have her tested through our local university, and their test results showed Amie, at 4 ½ years old, to be working a level comparable to 5 to 7 year olds depending on tasks. Obviously there was no need to hold her back, and we went ahead and started Amie in kindergarten. The infant development and pre-school programs had achieved what they were supposed to. Through this testing, we also determined that there was no need for special education because of her hearing disability. We felt that in order for her to develop as normal as possible in both speech and socially she needed to be mainstreamed as much as possible. Yes, she would have learned more sign language but she could have faced delays with her speech due to limited exposure to normal speech in that environment. Since sign language was not her major communication tool any more, it became secondary. The next concern was whether to place Amie in public or private education. We chose private because we felt, we as parents would ultimately have a little more control. The school we picked for Amie had a ten to fifteen students per teacher depending on grade level. I was able to do volunteer work in the classroom whenever I chose. The children were generally very accepting of Amie. We found that at the beginning of any new schooling situation if someone went in and told the students about Amie and answered questions children might have, the problems of teasing were avoided more often than not. Amie stayed in private schooling to the fourth grade. As mentioned earlier, employment changes for Don led us to move from California to Texas. In our discussions of the move from California to Texas, Amie asked if she could try public schools. The one thing she didn’t like about private schools is that the friends you make at school don’t necessarily live in your neighborhood. To run outside and play was hard if you didn’t know anybody, and it was hard to get to know neighborhood kids if you’re not at the neighborhood school. So in the middle of fourth grade Amie made the change from private to public schools. Before our actual move, we visited the new school Amie would attend and met with Amie’s new teachers and the school staff. It was suggested that Amie write a short letter to tell about herself, and put a picture with her letter. That was then taken to each classroom throughout the school where all the children were allowed to read Amie’s letter, look at her picture and have open discussions with their teachers. When Amie started school after Christmas, everyone knew her. There were no funny remarks or snide looks; Amie was just another student. Of course she didn’t know anybody, but that soon changed. That move went smoothly, everybody was surprised and pleased at what a little pre-work could do. For the most part, Amie did not have much difficulty at school from teasing. Where I noticed the most uncontrollable stares and snickers was in environments away from our general neighborhood, like shopping malls. 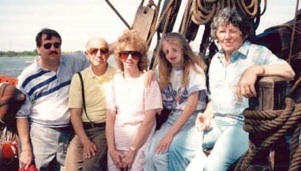 It was more noticeable when we were out as family, than if she was with a group of her friends. If Amie was with friends, she just blended in with the group, because she was already accepted by her group of friends. Amie then was more easily accepted by others as well. The only major problem Amie had in school occurred in sixth grade. In Texas, the Junior High grades are 6th, 7th and 8th. There was a girl in Amie’s P. E. class that was picking on Amie. After the usual tactics, like trying befriend or to ignore this girl, failed, Amie reported the problem to the teacher. The teacher apparently got nowhere as the problem continued. Finally, Amie complained to me. Normally Amie was able to deal with most situations on her own, but in this case this other girl was relentless. The next step was to go in and see Amie’s school counselor about changing Amie’s schedule around. In that meeting, I found out the girl who had been harassing Amie was a 15 year old that had been continuously held back because of problems. Mind you, this is sixth grade with a normal age group of between 11 to13. After a few choice words with the counselor, the other child was moved out of Amie’s P. E. class. Why should Amie, who was in all honors classes have to have her whole schedule changed because this one girl had a problem? Amie still saw her around school but only in passing, so exposure was kept to a bare minimum. My point here is that for the most part you need to let your child handle their own problems and only step in if they ask you to. There will always be people who feel better after they pick on someone else, and I’m sorry to say, there’s not much that anyone can do about those poor souls. Your not going to be there for all your child’s bad encounters, and the sooner they learn to deal with those people, the better off your child will be in the long run. We, as parents, want to protect our children from all hurt and ridicule; realistically that’s just not possible. They have to learn for themselves how to handle rude people, and given the opportunity they do. If you don’t believe me read Amie’s story, "Pinocchio’s Family Tree." Amie did very well academically in school. All through school both private and public she was an "A" student. Where there were honor classes, Amie was in them, and did very well. Amie received many honors and awards throughout her school career, the one I think she is most proud of (certainly her parents are) is the fact the she was Salutatorian of her graduating class in high school. That in itself, showed how hard Amie had worked. She had earned every A she received because she had worked for them. We also gave Amie opportunities outside of school. Amie took piano lessons both in California and in Texas. I think if we could have moved Joann, our California piano teacher, to Texas with us Amie would have continued taking lessons to this day. They say the teacher makes all the difference, and they are right. Somewhere along the way Amie developed a love for horses, it could have been that both her Mother’s and Grandma’s love for horses rubbed off on her, who knows. 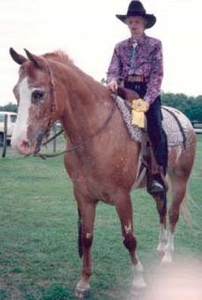 While living in Sugar Land, Gramma and Grampa started Amie with riding lessons. Of course, that love blossomed. After seven years in Sugar Land, we moved to the country and bought 10 acres and of course a couple of horses. Amie to this day loves horses but due to the fact that Austin is two hours away from our home in Bellville, and since Amie can’t make it home as often as she would like to, she’s had to give up horses for now. It was a sad day when we sold Hobo and Quince. There will be other horse opportunities later in life for Amie I’m sure. So you see growing up with Treacher Collins was a little bit of an inconvenience for Amie but like she has said before, its because of it that she is the person she is today. Each person or child will handle the situation differently. If one is raised in a secure loving environment, whether they have a disability or not, should not matter. I’ve always believed that God doesn’t give a person more than He feels he can handle.